10 Broadcaster Press 1101 February 05, 2013 www.broadcasteronline.com Announcements - 1101 Events The Luther Center at USD: Life at the corner of campus and faith. Located at Cherry & Plum Streets, Vermillion. We worship weekly on Wednesday evenings at 8:30pm and host service and fellowship events throughout the year. Visit us online at www.luthercenter.org or find us on facebook! The Vermillion First United Methodist Church, a welcome place reaching out to all God's people. Located at 16 N. Dakota St. Adult Sunday School 9am; Sunday Worship 10:25am; Children’s Church after Children’s Sermon (PreK-5). Welcome Table-serving free meal Mondays 5:30-7pm. Youth Group with Meal (Gr. 6-8) Wednesdays 5:30-7pm. High School Youth Group 7pm. Adult Choir Rehearsal 7pm. Praise Band rehearsal 8pm. Friday Morning Book Study and Breakfast 6:45am. Call (605)624-2179 for more info. Pastor Rick Pittenger. Trinity Lutheran Church Fall Worship Schedule: Saturday evening: 5:30 PM and Sunday morning: 10:00 AM Radio broadcast: Sunday morning at 10 AM on KVTK Radio, AM 1570. Holy Communion celebrated each Saturday evening and the 1st and 3rd and 5th Sundays each month.Pastor Trisha Boese Facebook: Trinity Lutheran Vermillion, SD Unitarian Universalist "The Uncommon Denomination." Services are the first and third Sunday of each month at 7 p.m. in the basement of the United Church of Christ, 226 E. Main. Child care services and refreshments provided. All welcome. Info: www.unitarianvermillion.blogspot.com UNITED CHURCH OF CHRIST CONGREGATIONAL, 226 E. Main St., Pastor Steve Miller. 10:30a.m. Worship Service. No Longer S t r a n g e r s www.uccvermillion.org Vermillion Alcoholics Anonymous Group: A fellowship of men and women banded together to help each other recover from alcoholism. Meetings are held in the Post Office basement. Closed AA on Tuesday, 8 p.m. Closed AA on Friday, 8 p.m. Vermillion Food Pantry is located at 816 E. Clark Street. Check our website to see if your family would be eligible for food assistance this month. www.vermillionfoodpantry.org Please Recycle! Announcements - 1270 Events JUST WANT TO ADVERTISE TO THE MIDWEST? Place your classified ads in the Midwest Classified Network anytime online at www.midwestfreeclassifieds.com (MCN) 1200 Cars A-1 DONATE YOUR CAR! Breast Cancer Research Foundation! Most highly rated breast cancer charity in America! Tax Deductible/Fast Free Pick Up. 1-800-399-6506 www.carsforbreastcancer.org nani CARS/TRUCKS WANTED! Top $$$$$ PAID! Running or Not, All Years, Makes, Models. Free Towing! We're Local! 7 Days/Week. Call Toll Free: 1-888-416-2330 nani DONATE A CAR - HELP CHILDREN FIGHTING DIABETES. Fast, Free Towing. Call 7 days/week. Non-runners OK. Tax Deductible. Call Juvenile Diabetes Research Foundation 1-800-578-0408. nani DONATE YOUR CAR, TRUCK OR BOAT TO HERITAGE FOR THE BLIND. Free 3 Day Vacation, Tax Deductible, Free Towing, All Paperwork Taken Care Of. 888-757-6941 (MCN). MISC AUTOS: CASH FOR CARS: Any Make, Model or Year. We Pay MORE! Running or Not Sell your Car or Truck TODAY Free Towing! Instant Offer: 1-888-420-3805 (MCN). 1215 Four Wheel Drive 1989 Chevy 3500 EXT Cab, 454, auto. (605)660-4306. 1250 Motorcycles Buying ATV?s and Side by Sides. Prefer projects. Will pick up. Call (402)371-7002. WANTED JAPANESE MOTORCYCLE KAWASAKI 1967-1980 Z1-900, KZ900, KZ1000, ZIR, KZ1000MKII, W1-650, H1-500, H2-750, S1-250, S2-350, S3-400 Suzuki GS400, GT380, CB750 CASH PAID. FREE NATIONAL PICKUP. 1 - 8 0 0 - 7 7 2 - 11 4 2 , 1-310-721-0726 usa@classicrunners.com nani Utility Trailers IN “60” 2014 models Aluminum Trailers: Utility, ATV's, UTV's, Motorcycle, Lawn Mower, & Golfcart Trailers. PRICES BELOW LAST YEAR! 5 year Warranty & LED lights. 82” x 16' 7K Carhauler $1999.00, 7K Tandem axle dump $3399.00, Motorcycle Pull-be-hind Cargo's $1325.00 & up. ZACK SHACK's $4499.00 6-hole ice house. www.fortdodgetrailerworld.com 515-972-4554 (MCN) 1400 Services PREGNANT AND AFRAID? C a l l Birthright 665-5580 (Yankton); 258-3436 (Sioux City); 3348 4 1 1 (Sioux Falls); 1-800-550-4900 ( t o l l free). 1410 Agriculture 4WD QUALITY OFF-ROAD MINI TRUCKS FOR SALE 40MPG automotive engine, HEATER, full FUNCTION Cabs & more, several models to choose from. www.ulmerf a r m s e r v i c e . c o m (605)387-5660 or (605)661-5050, Menno, SD. Sucker Rod & Pipe. All sizes for fencing and manufacturing. Menno, SD. (605)387-5660 (605)661-5050. 1415 AC - Heating Heat your entire home, water and more with an OUTDOOR WOOD FURNACE from Central Boiler. Bearnes Enterprises (402)-256-3048. 1455 Computer Internet Professional support for all things Mac including Adobe InDesign, Photoshop, Illustrator, QuarkXpress, Microsoft Office Suite, Creator, software and hardware conflicts or failures. 15+ years experience. Call Slayton Solutions at 515-360-8100. (MCN) 1460 Contractors VERMILLION CONSTRUCTION CO. Poured Foundations, Flat Work; 40-Plus Years Experience; Commercial & Residential; Free Estimates. (605)658-2345. 1475 Other Services TONER CARTRIDGES RECHARGES for fax, copiers, and printers. Yankton Office Equipment, 314 W. 4th (605)665-2289. Tell Them You Saw Coyote Barber Shop. All It In The types hair cutting. Monday-Friday 8am-5pm, Saturday VerBroadcaster! 8am-12Noon. DowntownMain. million, 117 E. (605)624-8181. 624-4429 Read & Recycle! NOW ACCEPTING CONSIGNMENTS! Spring Farm Machinery Consignment Auction Thursday March 14th, 10:00 a.m. 1490 Lawn - 1615 Houses For Rent 1760 Landscaping Adorable 2-bedroom house LOWER WILL REMOVE TREE Stumps. Schumacher Tree Stump Removal, Insured. Dennis Schumacher, Call (402)388-4487. FRUIT TREES Low As $15.00! Blueberry, Grape, Strawberry, Asparagus, Evergreen & Hardwood Plants. FREE Catalog. WOODSTOCK NURSERY N1831 Hwy 95 Neillsville, WI 54456 Toll Free 888-803-8733, www.wallace-woodstock.com (MCN) Toben Tree Service: Trimming, tree stump removal, landscaping, pasture clearing, Cedar tree removal. Firewood/camping packages available. Fully Insured. Commercial/Residential (605)660-4640. 1505 Painting Ace Painting Tony Souhrada, Owner. Interior & Exterior painting, wood staining & varnishing, spray texturing. Serving Vermillion and Yankton surrounding area’s since 1981. Residential/Commercial/Farm. (605)463-2436 or (605)661-0179. Superior Painting Professional Interior/Exterior painting. References available. No job too big or small. Free estimates. (605)661-0972. 1555 For rent, nice large 4-bedroom house near campus. 2-bath and garage, available in June. $1200. Call (605)670-8970 or (605)670-4828. MAKE YOURSELF AT HOME 3+ BEDROOM HOUSE-NEW CARPET & PAINT (VERMILLION) This is a 3+ bedroom 1 1/2 bath home with a nice yard and parking off alley. An added bonus to this home is the very close access to USD and downtown. Appliances include refrigerator, washer and dryer. $750 per month or $900 with 3+ adults plus deposit. Available Immediately. Please call to set up time to view this home. (605)760-3242 Soon to be for rent: Newly remodeled two story home in rural Tyndall area. 5-bedrooms, single bath with laundry room. Home is energy efficient. (605)660-4306. 1650 Houses For Sale Dogs - Puppies For Sale: Miniature Australian Shepard Puppies. Available now. Males and females. All colors, 308-653-2147, 308-201-0037, sandhillaussies@yahoo.com. 1605 close to campus with 1.5 baths, full basement, and washer/dryer/microwave/dishwasher. Call (605)624-6552. Apartments For Rent 3-Bedroom Apartments. River Court Apartments, Vermillion. Rent based on income. Must qualify by family size and income. One unit is Handicapped Accessible with roll in shower. Equal Housing Opportunity. 605-202-0008 or Skogen Company 605-263-3941. For rent, large 4-bedroom duplex, with all appliances. 2-bathrooms, double car garage, excellent condition, available in June. $1200. Call (605)670-8970 or (605)670-4828. For Rent: One Bedroom Apt. for elderly or persons with disabilities at River Court Apt. 24 E. Duke, Vermillion. HDC accessible. Must qualify by income. Rent based on income. Equal Housing Opportunity. 202-0008 or Skogen Company (605)263-3941. www.broadcasteronline.com WANTED Cottonwood & Walnut Trees Along river bottoms, creeks, & streams. Call Miles: 402-278-1476 204 Brown St., Gayville 4-Bedroom, 2-full bath, 1881 sqare feet, 2+ car garage. 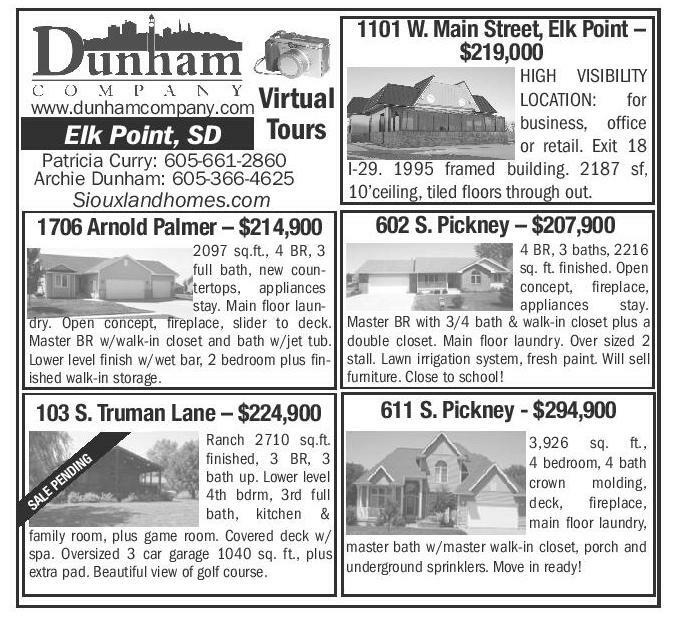 ( 6 0 5 ) 6 6 0 - 7 5 3 7 www.yankton.net/204brown/ 1655 Mobile Homes For Sale HIGHEST CASH PRICES PAID FOR MOBILE HOMES Call (605)624-8001. 1660 Acreage - Lots For Sale 20 ACRES FREE! Own 60 acres for 40 acre price/payment. $0-Down, $168/mo. Money Back Guarantee, NO CREDIT CHECKS. West Texas. 1-800-843-7537 www.SunsetRanches.com nani 1700 Merchandise EdenPURE® Portable Infrared Heaters. Join the 3 million beating the cold and winter heating bills. SAVE $229 on our EdenPURE® Model 750. CALL NOW while supplies last! 1-888-686-8209 (MCN) Call Classi?eds 665-7811 Girard Auction & Land Brokers, Inc. (605) 267-2421 Toll Free: 1-866-531-6186 www.GirardAuction.com THAT CABLE BILL! Get Satellite TV today! FREE System, installation and HD/DVR upgrade. Programming starting at $19.99. Call NOW 1-800-935-8195. nani 1795 Musical Items **OLD GUITARS WANTED! ** Gibson, Martin, Fender, Gretsch, Epiphone, Guild, Mosrite, Rickenbacker. Prairie State, D'Angelico, Stromberg, and Gibson Mandolins/Banjos. 1920's thru 1980's. TOP CASH PAID! 1-800-401-0440. nani 1815 Miscellaneous STEEL CULVERTS FOR SALE: New, All sizes. (605)661-5050 or (605)387-5660. Ulmer Farm Service, Menno, SD. AIRLINE CAREERS begin here - Become an Aviation Maintenance Tech. FAA approved training. Financial aid if qualified - Housing available. Job placement assistance. Call AIM (888)686-1704. nani ATTEND COLLEGE ONLINE from Home. *Medical, *Business, *Criminal Justice, *Hospitality. Job placement assistance. Computer available. Financial Aid if qualified. SCHEV authorized. Call 800-401-2385 w w w. C e n t u r a O n l i n e . c o m (MCN) ATTEND COLLEGE ONLINE from Home. *Medical, *Business, *Criminal Justice. Job placement assistance. Computer available. Call 800-510-0784 www.CenturaOnline.com nani Bundle & Save on your CABLE, INTERNET PHONE, AND MORE. High Speed Internet starting at less than $20/mo. CALL NOW! 800-291-4159. nani CASH FOR CARS: All Cars/Trucks Wanted. Running or Not! Top Dollar Paid. We Come To You! Any Make/Model. Call For Instant Offer: 1-800-864-5960. nani DISH Network. Starting at $19.99/month PLUS 30 Premium Movie Channels FREE for 3 Months! SAVE! & Ask About SAME DAY Installation! CALL - 888-543-6232 (MCN). FREE RX SAVINGS CARD Save up to 85% at over 60K pharmacies. All US Residents qualify. CALL 888-960-0026. nani Gold and Silver Can Protect Your Hard Earned Dollars Learn how by calling Freedom Gold Group for your free educational guide. 888-488-2921 (MCN) WANTED Buying all types of SCRAP IRON Farm Machinery • Cars & Trucks References Available • Top Market Prices Paid Home: 402-945-1512 • Cell: 402-533-3640 K&K Iron & Metal 1101 W. Main Street, Elk Point – $219,000 Located: Girard Auction Facilities, Wakonda, SD Call today! Tractors, Tillage Equipment, Hay Equipment, Planters, Trucks, Trailers, Skidloaders, Skidloader Attachments, Construction Equipment, Livestock Equipment, Vehicles, RVs, ATVs, Boats, Campers, Tools, Lawn & Garden Equipment, and Guns. The earlier you consign, the more advertising your items will receive! Strong market for good, clean equipment regardless of age. Advertising Deadline: Feb 27th. Toll Free: 1-866-531-6186 or email your consignments with photos to girardk@iw.net. 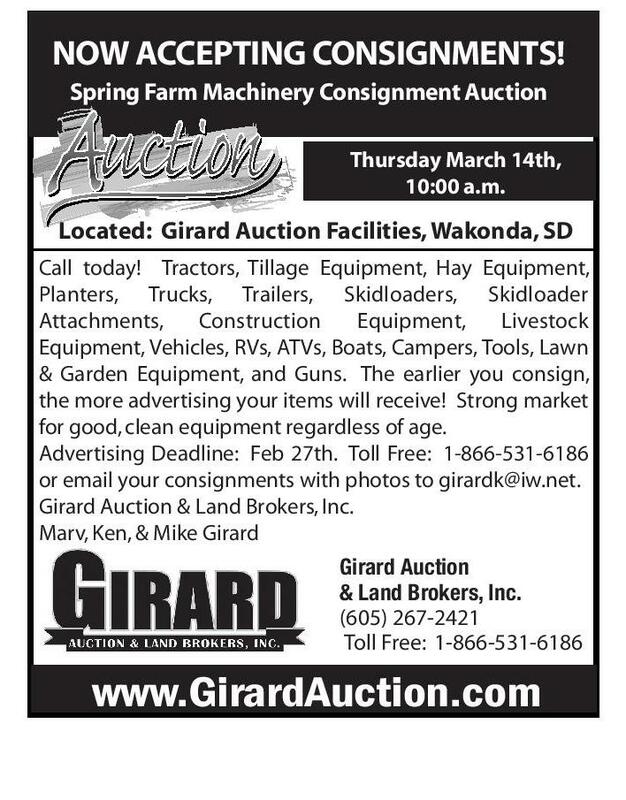 Girard Auction & Land Brokers, Inc. Marv, Ken, & Mike Girard Electronics www.dunhamcompany.com Virtual Elk Point, SD ONLINE ONLY UNRESERVED AUCTION www.bigiron.com Wednesday, February 13, 2013 First Lots Scheduled to Close at 10:00 AM Central Time NO BUYERS PREMIUM FEE & NO RESERVES!! 348 Lots Selling! 18 Tractors, Wheel Loader, 11 Planters, 2 Mower Conditioners/ Windrowers, 1 Dozer, 2 Skid Steers, 5 Grain Trailers, 4 Combines, Dump Trailer, 6 Semi Trucks, 4 Straight Trucks, Precision Farm Equipment, 8 Feeder Wagons, Tillage & Planting Equipment, Haying Equipment and much more! 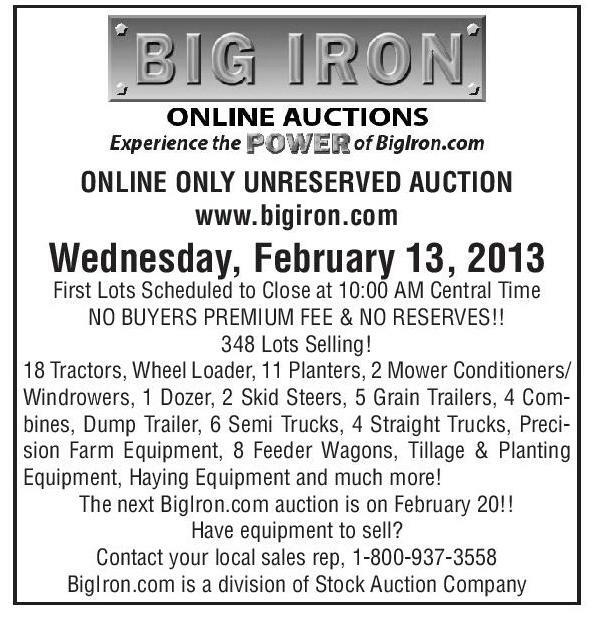 The next BigIron.com auction is on February 20!! Have equipment to sell? Contact your local sales rep, 1-800-937-3558 BigIron.com is a division of Stock Auction Company Tours Patricia Curry: 605-661-2860 Archie Dunham: 605-366-4625 Siouxlandhomes.com HIGH VISIBILITY LOCATION: for business, office or retail. Exit 18 I-29. 1995 framed building. 2187 sf, 10’ceiling, tiled floors through out. 1706 Arnold Palmer – $214,900 602 S. Pickney – $207,900 2097 sq.ft., 4 BR, 3 full bath, new countertops, appliances stay. Main floor laundry. Open concept, fireplace, slider to deck. Master BR w/walk-in closet and bath w/jet tub. Lower level finish w/wet bar, 2 bedroom plus finished walk-in storage. 4 BR, 3 baths, 2216 sq. ft. finished. Open concept, fireplace, appliances stay. Master BR with 3/4 bath & walk-in closet plus a double closet. Main floor laundry. Over sized 2 stall. Lawn irrigation system, fresh paint. Will sell furniture. Close to school! 103 S. Truman Lane – $224,900 611 S. Pickney - $294,900 Ranch 2710 sq.ft. 3,926 sq. ft., finished, 3 BR, 3 G 4 bedroom, 4 bath IN bath up. Lower level ND E crown molding, EP 4th bdrm, 3rd full AL deck, fireplace, S bath, kitchen & main floor laundry, family room, plus game room. Covered deck w/ spa. Oversized 3 car garage 1040 sq. ft., plus master bath w/master walk-in closet, porch and underground sprinklers. Move in ready! extra pad. Beautiful view of golf course.